“So, how long have you lived here?” Melissa Hammack says that’s a question many people ask her when she first meets them in Sandpoint. Hammack has lived here for just a few years, but she is a “grandmothered” local; her grandmother and father were born here. The Lakeside Inn, top center, was a landmark on Sand Creek before its razing in 2005. Melissa and her husband, David, are lucky. As twentysomethings, they could afford to buy a house, something a majority of people their age cannot do in Sandpoint due to a disparity between real wages and real estate prices that has been growing steadily over the past 10 years. 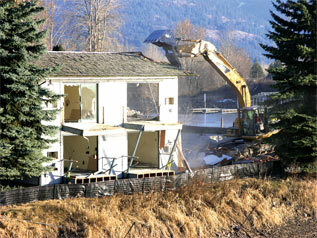 Ten years ago, Sandpoint Magazine published a story titled “Who We Are,” examining the image of our area in the wake of the shootout at Ruby Ridge; the presence at that time of white supremacists Richard Butler, Carl Story and Vincent Bertollini; and the decision of former Los Angeles Police Department detective Mark Fuhrman to move here in the midst of the O.J. Simpson trial. Fuhrman, painted as a rogue cop by Simpson’s lawyers, bought a house in Sandpoint that was the focal point of a media storm that went on for months and finally added up to little more than an inconvenience for people who lived on South Euclid Street. But since then, the price of that house has more than likely tripled. Diamond Jim Brady once said, “I don’t care what you say about me, as long as you spell my name right.” The dark publicity Sandpoint received in 1997 morphed into a long series of mostly glowing reports about what a great small town we have here, in publications like Sunset and Outside and USA Today. The results have been predictable. In some ways, we are being overrun, not by racists or misanthropes looking for a place to espouse their philosophy, but by money. The slow changes of the 1970s, ’80s and ’90s have ramped up in the the new century. Sandpoint is changing fast. The physical changes alone of the past 10 years seem staggering when added together. A multistoried condominium resort faces on the lake beside City Beach, where a decade ago a small remnant of the original town stood in a bucolic setting. The oldest building in town, which housed the original school, has disappeared to be replaced by a restaurant. Landmarks like Panhandle Milling, Harold’s IGA Super Foods and the Lakeside Inn have been razed, too. Across the lake on Gold Hill and behind town on the east face of Baldy Mountain, the fall of dark brings out a glittering collection of lights, some illuminating homes big enough for two or three families. The average house built in 1997 was a modest 1,800 to 2,000 square feet. Today, custom homes up to 10,000 square feet are being built, and Realtor Tom Renk notes many are second or third homes. Respectively, those properties list today for $195,000 and $225,000. While real estate has gone over the moon, wages lag along in typical North Idaho style. In 2005, Bonner County residents made about 30 percent less than the national average, with a median wage of $34,284 as compared to $43,318 nationally. Bonner County’s poverty figures are 13.4 percent, as compared to the 12.5 percent of the population nationally that lives below the poverty line. In the four years of 2002 though 2005, houses priced at less than $100,000 fell from just under 40 percent of the available units to less than 15 percent. Housing units priced over $250,000 rose from about 12 percent, to 34 percent of those available. The gated community has come to the Sandpoint area, too. No less than eight such developments are now within 20 miles of Sandpoint. Hidden Lakes, formerly a golf nirvana for locals, is being redeveloped into The Idaho Club, catering to a more upscale demographic. In defense of our town, and the people who have lived here for years, not all have gone bonkers about bucks. Steve and Linda Navarre have been in Sandpoint for over 20 years. Steve fixes cars. Linda teaches at Sandpoint Middle School (SMS). They see good and bad in the changes. “Traffic is what I notice,” said Steve. The Alliance was formed in 2002 to support public schools; in just its first four years, the group provided more than $300,000 in grants and put together an endowment fund of more than $1 million (see story, page 12). Bonner County Human Rights Task Force President Brenda Hammond and former Sandpoint mayor Paul Graves see one of the biggest changes as the growing gap between rich and poor. Hammond counts eight payday loan shops in and around Sandpoint, whose loans generally are taken out by people trying to make ends meet. That direction is working with the economically disadvantaged with programs like “Circles,” and Community Action Partnership. And in spite of the economic gap, Sandpoint still offers some of the best things about living in a small town. Kevin Watson, who had been in Sandpoint only a few months when he was interviewed for that 10-year-ago article, sees the best change as getting rid of the reputation that sparked the article. “What I think is the worst thing, though,” he added, “is the ‘sale’ of Sandpoint, because it means more sprawl and higher housing prices. Sandy Compton has been contributing to Sandpoint Magazine for 16.5 years. About 10 years ago the citizens, staff, mayor and council of the City of Sandpoint faced the usual litany of decisions about roads, services and public safety faced by any town of 6,500. Those issues are generally more difficult for Sandpoint because, as the county seat, it provides services for more than twice its population, swelling to triple during the summer tourist season. At North Boyer, and over- or underpass for the railroad may likely have to be constructed to ensure access for emergency response crews to reach a University of Idaho campus to be built here. Back then, the city and county officials were used to high unemployment, hovering through the 1990s at 9 to 10 percent – double the national rate. The timber industry with its comparatively well-paying jobs was suffering, becoming less and less the driver of the economy. Yet despite high unemployment, the county population was booming, posting a 30-percent increase from 1990-96, to 31,890. The boom added to the glaring gap between the 2,100 job openings the county reported during the year, and the 6,100 registered job applicants. Then an odd thing happened in 1997. The workforce shrank. In 1996 the county labor force numbered 17,090, but in the fall of 1997 it was reported at 16,850. Even odder, at the same time a business expansion began. The Idaho Department of Labor reported that between spring 1996 and fall 1997, Coldwater Creek added roughly 1,000 jobs, while Litehouse Foods added 70 jobs at its food processing plant. Wal-Mart, with 225 jobs, and Life Care Center, with 80, opened their doors. The sudden expansion was not planned for or guided by the local governments. The area just got lucky – lucky that Coldwater Creek and Litehouse did so well and decided to stay in their hometown. That good fortune has continued as other flourishing businesses have added jobs, among them Thorne Research, Lead-Lok, Unicep, Encoder, Quest Aircraft, Panhandle State Bank and others. And other smaller businesses, from retailers to restaurants, have benefited indirectly or directly because of those successes. Here’s one measure: In the mid-’90s, building permits for commercial enterprises averaged one to four per year. In the last two years, the average has been 17. All these business successes have brought not only new revenue and more people but also new demands on services. 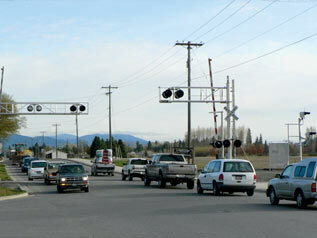 Today, the county population has topped 42,500 and Sandpoint’s population has risen to an estimated 8,300. The unemployment rate is 3.7 percent and, in an about-face to 1996, when there were almost three applicants for every job opening, Idaho Department of Labor reports that in 2006 in Bonner County there were 4,305 registered applicants with 2,578 job openings – or only 1.7 applicants per job listing. In other words, a job seeker has much more of a chance today. The new demands on everyone, especially the City of Sandpoint, are unprecedented. Kim Woodruff, director of City Parks and Recreation, has been with the city for more than 20 years and notes increases in demand for recreation programs and park space. In the last 10 years, the city has added more than 17 acres of new parks and, for the citizens of Sandpoint alone, the ratio of parkland to citizens is good. But, in serving the larger county population, those additions are not enough. With an explosion of club sports in early 2000, particularly soccer, and now lacrosse, space is short. “A good portion of the people playing club sports come from outside Sandpoint,” said Woodruff. He is not against people from nearby cities using the resources – City Beach has served non-city residents since its construction in the 1950s – he is just faced with the problem of how to deliver the services. “Bottom line: There are no easy answers,” he said. Growth has made even greater demands on the Public Works Depart­ment. Director Kody Van Dyk has been with the city almost as long as Woodruff and he, too, sees an increase in numbers and complexity. Today, water and sewer services are still an issue but, now, a bigger issue. Van Dyk says growth will require major upgrades to water and sewer treatment plants that may cost in the tens of millions. The needs in the overall urban area has prompted the cities of Kootenai, Ponderay and Sandpoint to talk about regionalizing the water and sewer systems. If that weren’t enough, a recently completed Urban Area Transportation Plan points out the critical need for another north-south connector road: the reconstruction of Great Northern Road at a cost of about $7 million. That same plan forecasts that Boyer Avenue and Larch Street will need major reconstruction to keep pace with large projects now pending. One is a major development to include stores and condos on 27 acres at Boyer and Larch. The other is a new University of Idaho branch campus to be built in just three years on a portion of 77 acres on North Boyer. The streets that service these new endeavors will have to be rebuilt and, as one traffic study points out, an additional east-west road connecting Boyer to Highway 95 should be built. What’s more, an over- or under-railroad pass on Boyer is likely also needed to ensure dependable fire and police response. The city and its partners are not just sitting around wringing their collective hands over the dynamic forces that have hit Sandpoint. A new, full-time planning director, Jeremy Grimm, was just hired. An urban renewal agency was created to help spread the costs of infrastructure improvement over more taxpaying citizens than just those in Sandpoint. In the last five years, outside expertise has been hired to help the city assess and write plans for downtown revitalization, parking, urban transportation, water and sewer expansion, and affordable workforce housing. Perhaps most importantly, the city has embarked on a process to rewrite the current, 1970s-era comprehensive plan. This process will hopefully, through citizen input over many months, provide direction for the city. Citizens have also stepped up to address long-neglected needs. There are now city committees or commissions on pedestrian issues, public art, historical preservation, parks and recreation, municipal forestry and downtown business. Aside from posing the practical problem of managing growth, the change Sandpoint is experiencing brings a different kind of pain: a pain of conflicting values. The city council and mayor and staff often face decisions with larger consequences than, say, the one they made a few years ago to not allow dogs in the parks. Last year’s decision by the city permitting homegrown Panhandle State Bank to build a three-story, brick financial center in the downtown core faced emotional opposition from people who see its height and size as one more example of how the small-town character of Sandpoint is being lost forever. Yet the project also has supporters who see the building and the bank’s success as an opportunity to retain well-paying jobs and keep downtown vital. When the new UI campus is open, the people who have always said, “Sandpoint is a college town without a college,” will be joyful. However, there will be others who feel crowded out by new people and more traffic. And, how will they react to a new class of people in town – the college students – and the kinds of new, cultural outlets they will create with their buying power? And what about infrastructure costs to support the college? There sure seems to be, as Kim Woodruff observed, no easy answers. But it’s the hard questions being asked now – questions not imagined 10 years ago – that will shape our growth. In February Sandpoint turned 106, and perhaps that’s a sign as well: With maturity comes hard questions but not easy answers. Stephen Drinkard is projects coordinator for the City of Sandpoint.